Cybersecurity is an issue for all industries, but within the legal sector, there are multiple high-risk factors including confidential client information, legal documents, and financial records. 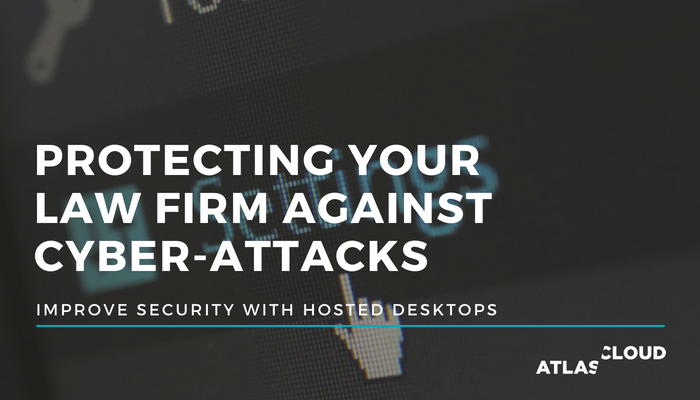 It’s because of these very factors that law firms are big targets for cyber-attacks. With an estimated value of £38.53bn last year, there is clearly a lot on the line for the legal industry further justifying why each law firm should consider the cloud for stronger cybersecurity measures. Your data is kept safe in one of our UK data centres with bank-grade security. As Atlas Cloud is a managed service provider, we make sure security checks are completed regularly as per our ISO 27001 certification standard. All of your emails, data and applications will be delivered through one secure, single-view platform. Anyone or no one. Through our partnership with Mimecast, and as the data controller, you can give and block access to data files for whomever you choose. This quickly blocks any unauthorised staff from seeing confidential files or accessing legal documents. While Atlas Cloud can manage the overall high-level security of your data, you still have full control of your data so you can put as much or as little in the cloud as you wish. You can even add extra security to your email by putting security measurements in place that stop files over a certain size being to an external email address or if the file contains specific words. Don’t leave your law firm vulnerable to cyber-attacks which can be easily prevented with a GDPR ready and ISO 27001 managed service provider like Atlas Cloud. To find out more about our cloud service, Mimecast or our Disaster Recovery option for more advanced security, get in touch with our team today.